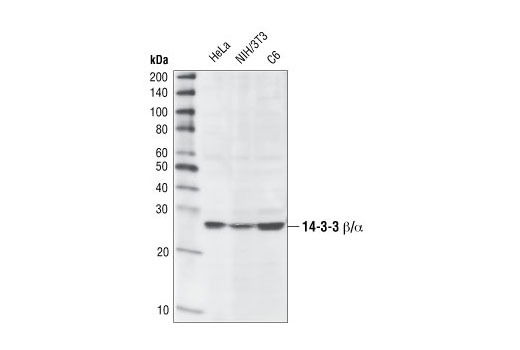 Western blot analysis of extracts from HeLa, NIH/3T3, and C6 cells using 14-3-3 β/α Antibody. 14-3-3 β/α Antibody detects endogenous levels of total 14-3-3 β/α protein. Polyclonal antibodies are produced by immunizing animals with a synthetic peptide corresponding to the sequence of human 14-3-3 β/α. Antibodies are purified by protein A and peptide affinity chromatography. The 14-3-3 family of proteins plays a key regulatory role in signal transduction, checkpoint control, apoptotic and nutrient-sensing pathways (1,2). 14-3-3 proteins are highly conserved and ubiquitously expressed. There are at least seven isoforms, β, γ, ε, σ, ζ, τ, and η that have been identified in mammals. The initially described α and δ isoforms are confirmed to be phosphorylated forms of β and ζ, respectively (3). Through their amino-terminal α helical region, 14-3-3 proteins form homo- or heterodimers that interact with a wide variety of proteins: transcription factors, metabolic enzymes, cytoskeletal proteins, kinases, phosphatases, and other signaling molecules (3,4). The interaction of 14-3-3 proteins with their targets is primarily through a phospho-Ser/Thr motif. However, binding to divergent phospho-Ser/Thr motifs, as well as phosphorylation independent interactions has been observed (4). 14-3-3 binding masks specific sequences of the target protein, and therefore, modulates target protein localization, phosphorylation state, stability, and molecular interactions (1-4). 14-3-3 proteins may also induce target protein conformational changes that modify target protein function (4,5). Distinct temporal and spatial expression patterns of 14-3-3 isoforms have been observed in development and in acute response to extracellular signals and drugs, suggesting that 14-3-3 isoforms may perform different functions despite their sequence similarities (4). Several studies suggest that 14-3-3 isoforms are differentially regulated in cancer and neurological syndromes (2,3). Muslin, A.J. and Xing, H. (2000) Cell Signal 12, 703-9. Mackintosh, C. (2004) Biochem J 381, 329-42. Dougherty, M.K. and Morrison, D.K. (2004) J Cell Sci 117, 1875-84. Yaffe, M.B. (2002) FEBS Lett 513, 53-7. Bridges, D. and Moorhead, G.B. (2004) Sci STKE 2004, re10.